MOCAP Push-In Plugs For SAE and NPT Threads are designed for easy push-in applications in both SAE and NPT threaded openings. While providing an attractive finishing look, the plugs will protect threads and fittings without the need to screw them in. Simply snap them into place. Protects from moisture, dust and damage during production, shipping and storage. 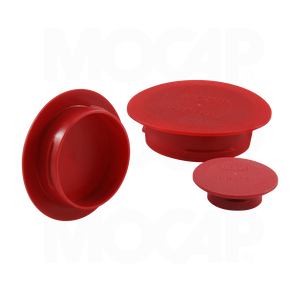 Our PIP Series Plugs are molded in Red polyethylene plastic and sized to fit SAE Threads from 1/4 thru 1-7/8 or NPT Threads from 1/8 thru 1. MOCAP stocks Push-in Plugs for SAE and NPT Threads in many sizes for immediate shipment.